What happened to the National Police academy project in Haiti promised by Canada? Haiti's Stability depends on Stronger National Police Force. Canada has reneged on its commitment, made six years ago, to construct a new national police academy near Port-au-Prince, Haiti. The $18 million police academy would have included classrooms and equipment to instruct 300 mid-level police; among them commissioners and inspectors (the Haitian National Police operates without either higher-ranking officers). The UN Security Council commented the Haitian National Police needs bolstering and it has become a "most critical task". The government of Haiti (GOH) must assume complete responsibility for its security needs pivotal to the country's general stability and economic growth. The UN peacekeeping mission, in Haiti for over 10 years, has renewed its stay until 2016. Haiti has never been a particularly safe haven for journalists. All too readily, the names of slain newsmen come to mind. This bad reputation that shouts an intolerance for freedom of the press continues with news from Reporter's Without Borders that as little as five journalists have been attacked either physically or verbally in Haiti within the last month, many in the town of Petit-Goave. While not exactly parallel to what has taken place in the past, given how far this bullying of reporters can go, the latest attacks on Radio Préférence FM Director Guyto Mathieu and others, seems to be the beginning of another cycle. On September 4, 2014, Mathieu was allegedly threatened at a demonstration by members of a group in opposition to the local government. He is said to be a Jacques Stevenson Thimoleon defender and, as such, put himself into the crosshairs of the opposition. As a step toward securing Haiti's borders and managing large scale domestic clashes--including attacks on the National Place--the Haiti National Police (PNH) now has access to three new armories. The three arsenals have been made possible by the tripartite partnership of United Mines Action Service (UNMAS); United Nations Stabilization Mission in Haiti (MUNUSTAH); and the PNH, with the support of the government of Haiti (GOH). 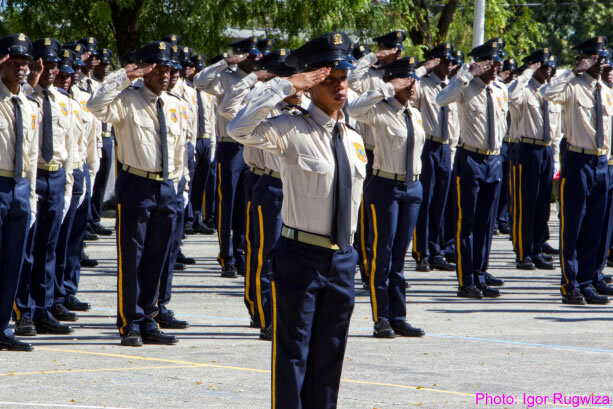 The launching ceremony took place at the Haitian Police Academy. Funded to the tune of $900,000 and administered by UNMAS, the armories are constructed of reinforced concrete, accomplished by the erection of iron columns (rebar) that become the support the cement is built around. It offers an impenetrable barrier that makes impossible theft and weapons loss. The project took four months to complete. President Michel Martelly is probably nostalgic and homesick for referring to Haiti national Police as the armed wing of the government during a speech at the graduation ceremony of the 24th promotion of the National Police of Haiti (PNH) last Friday. As usual, the opposition was quick to take issue with that and denounce the comment. Many people believe that this is another example where Michel Martelly has been trying to politicize the Police force in Haiti. The Haitian President also took the opportunity to praised the Police for their contribution in the overall improvement in security in the country, compared to the situation in previous years. Is this for real? 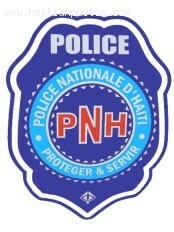 Do you think Haiti National Police is politicized? Has Martelly been able to use the force to oppress others on political basis? Present at the ceremony was: President Michel Martelly, the Minister of Justice and Public Safety, Me Jean Renel Sanon, the President of the Senate, Simon Dieuseul Desras, the President of the Chamber of Deputies, Me Jean Tholbert Alexis, the Director General of the National Police of Haiti, Godson Orélus and the Divisional Commissioner Francène Moreau. As part of a master plan to build up the tourism industry in Haiti, the government of Haiti (GOH) has established the Tourist Police, POLITOUR. 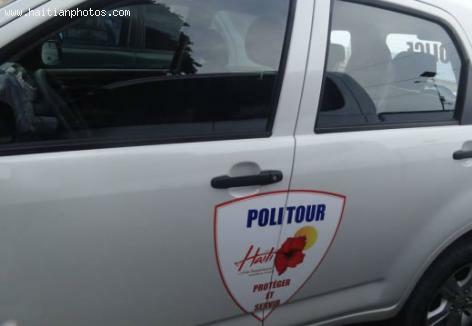 POLITOUR is a special unit of the Haitian National Police (HNP), created to insure the safety and security of visiting tourists. Commissioner and POLITOUR Director, Carl Boucher, made a presentation on POLITOUR. On hand for the presentation were North Regional Director of the Ministry of Tourism, Etienne; Cap-Haitien Municipal Association; North Vice-Delegate; Ministry Director of Planning and External Cooperation; and a rep of the North HNP. Boucher discussed formation of the special unit, and how it will be developed into an effective policing body. Its first assignment is the North Department. After testing, POLITOUR will be rolled out in well-populated tourist areas across the island.